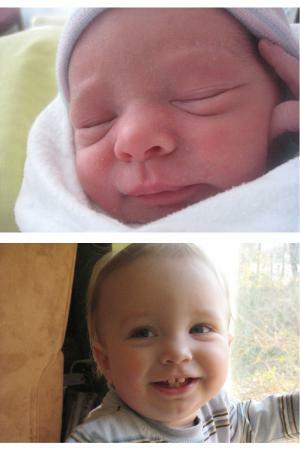 Happy first birthday, Oliver Aaron! Click below to watch "One Year of Oliver!" Oliver's face lights up the moment Eddie appears, and then he proceeds to bang on the window to keep Eddie's attention as long as possible. 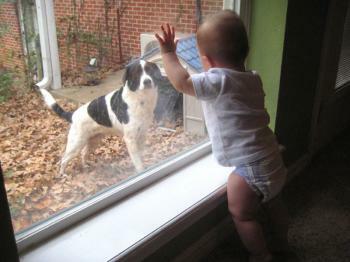 There's just not much sweeter than the love between a boy and his dog. We've had several snow and ice storms this winter, so we got to get all bundled up and go play in the winter wonderland. 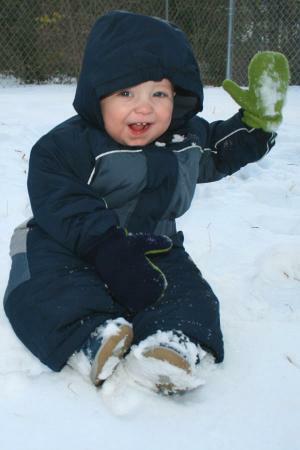 Oliver couldn't really do too much playing because he could barely move under all his layers, so he mostly just sat in the snow and did what he does best -- cheesed for the camera and looked adorable. 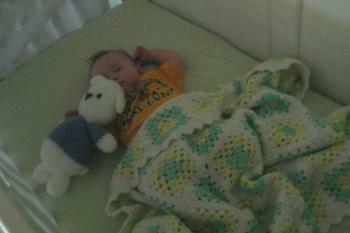 Speaking of what Oliver does best, what he didn't do best for the first eleven months of his life was sleep. We finally got tough and started letting him cry it out at bedtime and naptimes, and it while it was hard to listen to our baby cry, but he needed sleep and we needed sleep and we're all much happier now that we're getting some much-needed rest. Sleep is good! 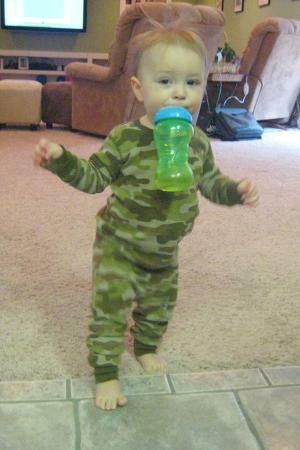 The most exciting development of Oliver's eleventh month was that he started walking. He had been pulling up and cruising around holding on to the furniture for the past couple of months, but when he decided to take off, he didn't look back. And as you can see, he's become quite talented at his newfound ability. With Oliver's latest skill also comes the potential for injury. 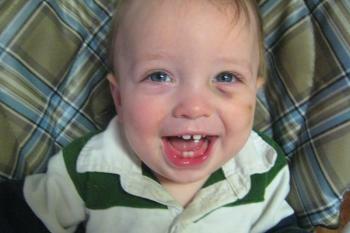 And with some of Coco's genes running through him, it's no big surprise that he's already had his first black eye. In the case of Oliver vs. the windowsill, this time, the windowsill won. You'll get 'em next time, Oliver! 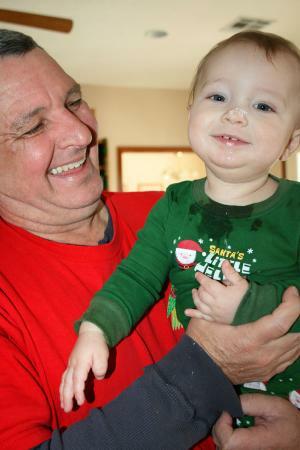 Back in November, we took a trip down to Houston and Oliver got to meet Grandpa Palko for the first time. 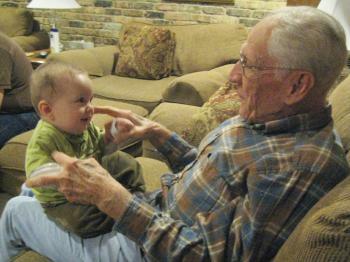 After Oliver warmed up a bit, he and Grandpa hit it off very nicely. While we were in Houston, we also went to the Downtown Aquarium. 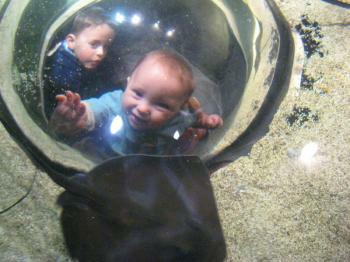 It was Oliver's first visit to the aquarium (Tyler's second visit), and the boys had a blast seeing all the fish and especially getting up close and personal with the stingrays through the special kid-sized bubble in their tank. 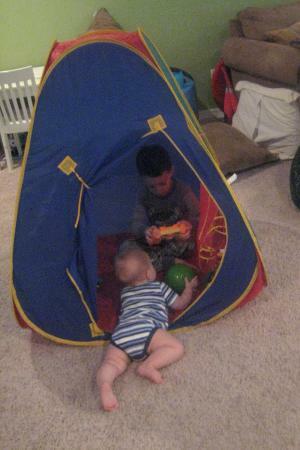 At about nine months old, Oliver figured out how to pull himself up to a standing position, and once he figured that out, he figured out he could get pretty much anywhere his big brother was to check up on him and what he's up to at any given moment. 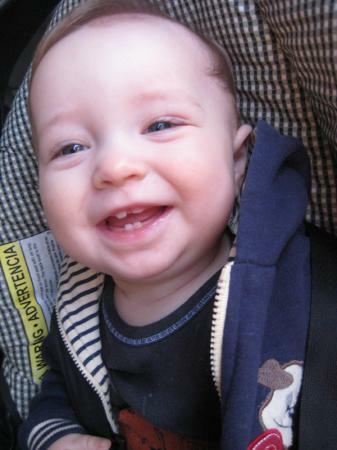 Between eight and nine months old, Oliver's first two bottom teeth started coming in and then soon after those, his top two teeth broke through, too. They didn't seem to bother him too much, and he was just happy that all the new teeth meant an end to all that disgusting pureed baby food and more real people food coming his way. And luckily, he has a big brother who is more than willing to sneak him bites of real people food off his own plate. 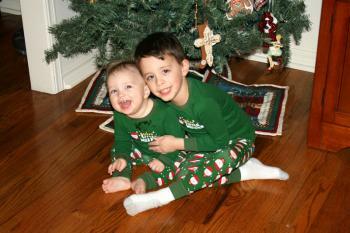 Our first Christmas with two kiddos was a very memorable one and also a very busy one, as always. 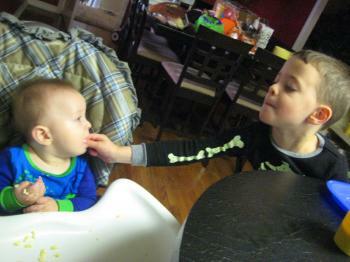 Tyler loved telling Oliver all about Christmas and having another little Santa's helper running around this year. Oliver had a blast opening presents, trying to eat wrapping paper, playing with all his new toys and being tempted with one of Papa's famous beignets. Yes, that's powdered sugar on Oliver's nose, but none of it made it to his mouth... at least not while his mama was watching! After outgrowing the bassinet he slept in for the first six months of his life, Oliver was finally evicted from Mama and Daddy's room and is sleeping in his crib now. 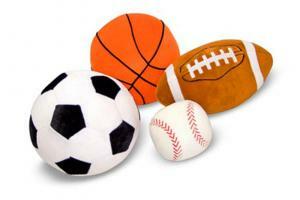 Well, if you can call his fifteen-minute naps and being up every three or four hours at night sleeping. But when he does actually sleep, he's almost cute enough to make up for his otherwise lack of sleep. We've been trying lots of new foods over the past couple of months, and Oliver is not at all shy about letting us know what he likes and doesn't like. 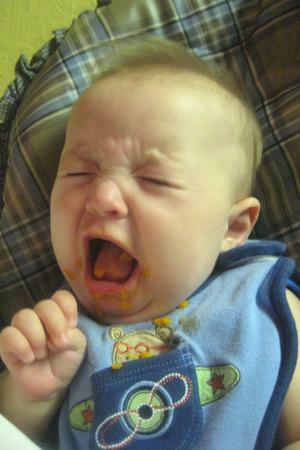 He didn't like squash or green beans -- and he made it quite clear that he did not care for carrots, thank you very much! The past few weeks, Oliver's not really been interested any of the pureed baby food anymore, but he will tolerate applesauce, pears and sweet potatoes, and his favorite so far, prunes. 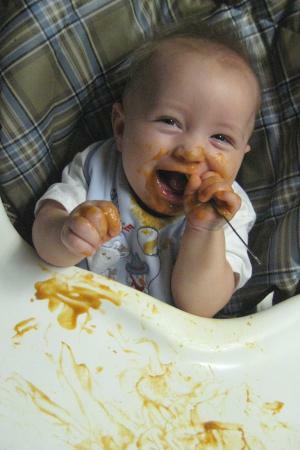 But he really prefers it when we just hand over the spoon and let him have at it. 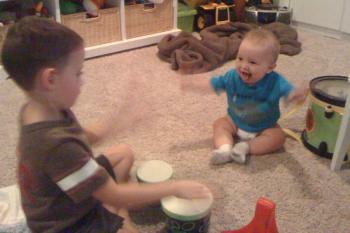 As part of his training for the Cantrell Brothers Band, Oliver has been enrolled in Drumming 101, taught by Tyler. Oliver pretty much lights up anytime his big brother looks at him, so it would be an understatement to say he's enjoying the drum lessons. 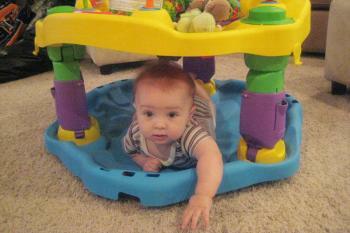 Our big boy is sitting up all by himself now and crawling all over the place. He's into everything now and that means he ends up stuck in some pretty funny places sometimes. 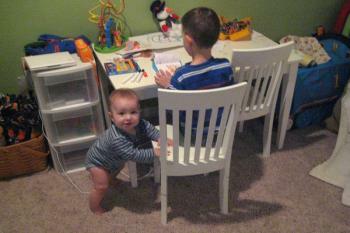 Oliver's newfound mobility means that he can always keep tabs on his big brother. Poor Tyler can't hide from his baby brother now. Even his tent isn't sacred anymore! Oliver's latest party trick is waving. 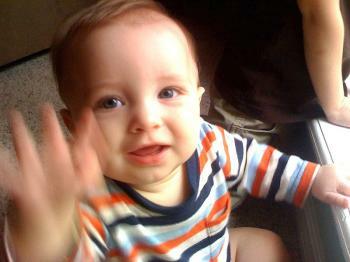 He can't say bye bye yet, but he can wave at anyone who's coming or going. 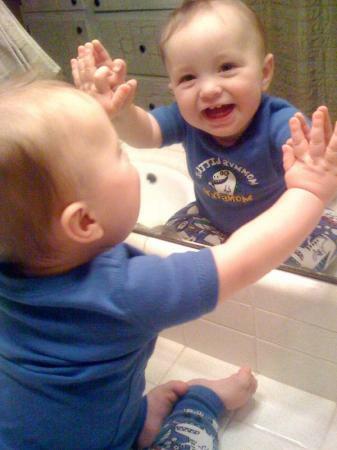 It might take him a few minutes, and sometimes the person is already long gone by the time he does wave, but it's still a pretty cute trick!